Polymer matrix composites are increasingly replacing traditional materials, such as metals, for applications in the aerospace, automotive and marine industries. Because of the relatively recent development of these composites there is extensive on-going research to improve the understanding and modelling of their behaviour – particularly their failure processes. As a consequence there is a strong demand among design engineers for the latest information on this behaviour in order to fully exploit the potential of these materials for a wide range of weight-sensitive applications. 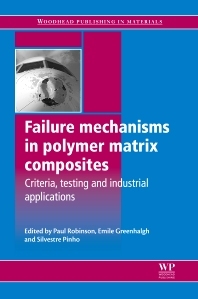 Failure mechanisms in polymer matrix composites explores the main types of composite failure and examines their implications in specific applications. Part one discusses various failure mechanisms, including a consideration of manufacturing defects and addressing a variety of loading forms such as impact and the implications for structural integrity. This part also reviews testing techniques and modelling methods for predicting potential failure in composites. Part two investigates the effects of polymer-matrix composite failure in a range of industries including aerospace, automotive and other transport, defence, marine and off-shore applications. Recycling issues and environmental factors affecting the use of composite materials are also considered. With its distinguished editors and international team of expert contributors Failure mechanisms in polymer matrix composites is a valuable reference for designers, scientists and research and development managers working in the increasing range of industries in which composite materials are extensively used. The book will also be a useful guide for academics studying in the composites field. Designers, scientists,and R&D managers working in these industries; academics researching in composites; other materials engineers working with composite materials in the sports equipment and power generation industries and the military. Dr Paul Robinson works in the Department of Aeronautics at Imperial College London, UK. He is widely renowned for his expertise on the failure mechanics of composite materials. Dr Emile Greenhalgh works in the Department of Aeronautics at Imperial College London, UK. He is widely renowned for his expertise on the failure mechanics of composite materials. Dr Silvestre Pinho works in the Department of Aeronautics at Imperial College London, UK. He is widely renowned for his expertise on the failure mechanics of composite materials.